When the interest-rate currents beat ceaselessly against you, even the strongest banks can be borne off course. Bank of America provided the latest example Wednesday. It reported third-quarter net income of $4.5 billion, or $0.37 a share, versus a loss a year earlier due to big legal charges. Revenue, though, shrank 2.5%, to $20.68 billion, from a year earlier. The top-line contraction is all the more striking given the positive news the bank reported. Core loans, which exclude the bank’s legacy portfolio of precrisis debt, grew 9.1% year over year. Deposit growth was solid. Long-term assets under management clocked in their 25th consecutive quarter of growth. Even the bad news wasn’t as bad as feared. Trading revenue fell 5% from a year earlier, excluding accounting adjustments. The bank’s fixed-income business posted an 11% revenue decline. But that isn’t a bad showing considering BofA derives 60% of this from credit trading, an area many expected to be especially weak given the low level of corporate-debt issuance in recent months. The bank’s net interest margin, however, contracted to just 2.1%. This means that even as the bank expands lending and grows its balance sheet, revenue gets squeezed. As does profitability. 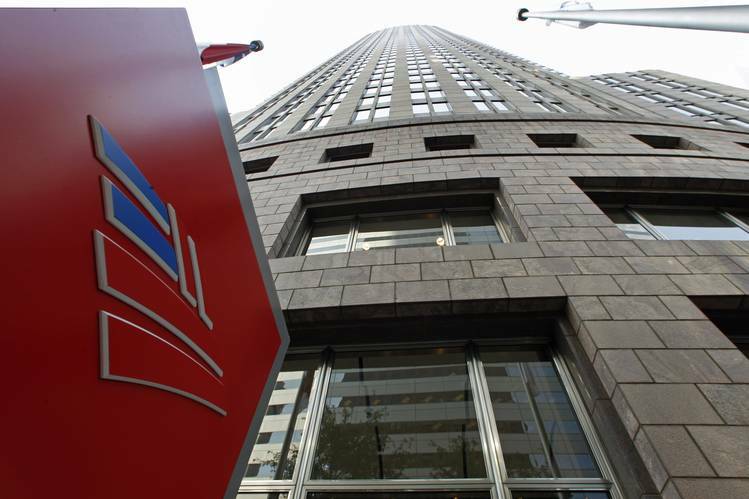 BofA’s return on average assets fell to 0.82%, from 0.99% in the prior quarter. Return on equity fell to 6.97% from 8.75%. That reverses a trend toward higher returns earlier this year and indicates the bank still isn’t earning its cost of capital. Year to date, the bank’s return on equity is a paltry 7.04%. Doubts about the bank’s ability to produce acceptable profits can be seen in the market’s muted reaction to the earnings announcement. Analysts had expected tangible book value to rise to $15.26 a share. This actually came in 1.5% higher, at $15.50. That was about in line with the gain in the bank’s shares, implying investors don’t see profitability improving anytime soon. Notably, even though Wells Fargo bucked the trend of falling revenue when it reported third-quarter results Wednesday, it, too, is struggling in this interest-rate environment. The bank reported its net interest margin was below 3% for the third consecutive quarter. Its return on equity, while handily beating that of its big-bank rivals, fell again. It now has been below 13% for three of the past five quarters. BofA executives tried to reassure investors that they are “focused on those things we can control.” The danger is that those things don’t appear to be enough to put the bank on a course to higher returns. With the Federal Reserve still on hold, the interest-rate tide may rock their boats for quite some time. Posted on October 16, 2015, in Postings. Bookmark the permalink. 1 Comment. Yeh, the banks are sucking….thankfully their regulatory compliance costs have come down due to relaxation of those requirements…. =<:-) + General Motors is doing so much better under new ownership….